Wilmington, NC downtown is widely know for it’s shopping, dining, and nice bars. Besides being a beach town the Wilmington, NC downtown scene is a great place to catch some scenic views, enjoy food, and visit a few attractions! Here are some of the best places to visit in Wilmington, NC downtown! Honestly, it’s nearly impossible to visit Wilmington downtown without going to the Riverwalk. The Cape Fear River is clear visible from all parts and the streets sloop down to the river. There are also condos located directly above the boardwalk. Please see my contact info if you are interested in Wilmington, NC real-estate! 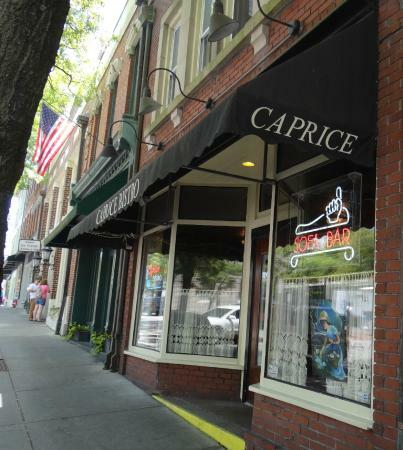 If you’re interested in dining while in downtown Wilmington, you want to check out Riverboat Landing or Caprice Bistro. Riverboat Landing: This restaurant is one of the oldest buildings in Wilmington and has the best views of the river you will ever see. Not incredibly expensive, but a place to go if you’re trying to impress somebody. Views are stunning and the building has a unique architecture. The Museums of the Bizarre – Seems like more of a carnival parlor with things like a “possessed clown”. I didn’t go to this museum…..
Serpentarium aka “The Snake Museum – This one is AMAZING. The whole building has an impressive array of snakes, lizards, and turtles. The best part is that it is located right near the boardwalk, so it’s very east to get to!